Who is Carmen la Cubana? Hi Luna. Congratulations for the success of Carmen. Can you tell us more about you and your work? I am from Havana and I am a musician. My parents are artists: my mother is a Theatre Director and a painter and my father was a scenographer. I did not train as actress but I did know theatre because I was in every rehearsal my mother had. It has been a big part of my childhood. I am a singer and I composer: I wanted to be a music teacher in Cuba, but I did it only for short time, after I graduated, because I had the chance to sing a song for a popular soap opera in Cuba and then that was the beginning of my solo career in Cuba. Can you tell us about Carmen La Cubana? It is a wonderful show. Carmen is an example of freedom and woman empowerment and she was one of the first when Bizet wrote the opera. 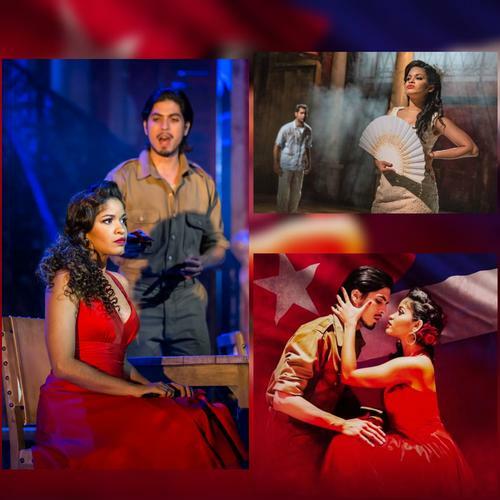 The fact that is set in Cuba – and with a Cuban cast – makes it very interesting because it really shows Cuban culture. It is a high-energy show, and I love it. Are you excited to perform in London? We are all very excited. I was dreaming about this: I love London, the city, the history, and everything about it. We are so excited for the reviews and the audience response. We are very lucky. It is London part of a tour? Yes, it is part of a tour. We have been in Cologne, Germany, and next we will go to Leipzig, Berlin, Zurich and then we will go to Shanghai, China.